My first thought as I begin to tackle this Land Trust is, “Holy crap, that’s a land in trust.” My second thought is, “cool, these should be trails I can bang out with my sons.” We just finished all of the Granby Land Trust trails, so it’s time to find a new place to go on Sundays. This may be it. I think we’ve exhausted the museums in the first four towns listed, so it’s definitely time to start seeing what each has to offer in its woods and fields and swamps. It also helps that this area isn’t too far away from our house in West Hartford either. 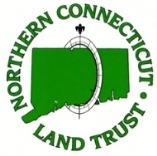 The Northern Connecticut Land Trust is a private, non-profit 501(c)(3) organization in the northeastern part of Connecticut. The Mission of the Trust is to preserve the natural resources of the northern Connecticut region including agricultural land and other ecologically important open space. As the only non-profit, open space protection group in the area, dedicated landowners come to the Trust to protect their heritage. Landowners may transfer land as a gift, sold at fair market value or the sale of land to the Trust below market value can offer income tax benefits to the donor. Deed restrictions, lifetime use by the donor, and other stipulations are opportunities for donors to consider. Each parcel is managed according to the donor’s wishes through our monitoring and stewardship programs. Conservation easements (whereby landowners may donate or sell development rights to their land while maintaining ownership and other property rights) is another option. I’m sort of drawn to Tolland here for some reason. Probably because Joshua’s Trust has properties in Tolland. So does the Town of Tolland. And the CFPA’s Shenipsit rolls through as well. Oh, and in 2015 (that’s next year from when I’m writing this) Tolland will celebrate its 300th birthday. So maybe I’ll focus on Tolland. (There is only one NCLT property in Tolland, and it’s not trailed as of today… so, yay! Tolland portion of the NCLT… done! But there are other towns and properties to actually hike here. Note: I’m not going to include the preserves with no trails/hiking, but these guys make this list-making fairly tough. Maps are rare on their website, but I’ll do the best I can.